Inspired by Scandinavian designs, our Nordic Dual Layer Wall Holder is the perfect wall decor for showcasing family photos, exquisite ornaments or elegant plants! Its 2-layer design allows for greater organization as well. Easy-to-assemble and sturdy, add a hint of Scandinavian to your home today! Keep your canned and bottled drinks organized with our Clear Can Drinks Organizer! Aside from maximising space, it’s special design allows you to pull and slide the holder to have easy access to all your favourite drinks – perfect! Save 5% with a 2-piece promo set! Save 10% with a 3-piece promo set! Whether is it for the bathroom, bedroom or in the living room, our Everyday Floor Mat will certainly add pleasing aesthetics and comfort to your nest! Designed with an absorbent topside with anti-slip paddings on the underside, it is very safe – suitable for homes with kids or the elderly. Bring home a matching pair today! 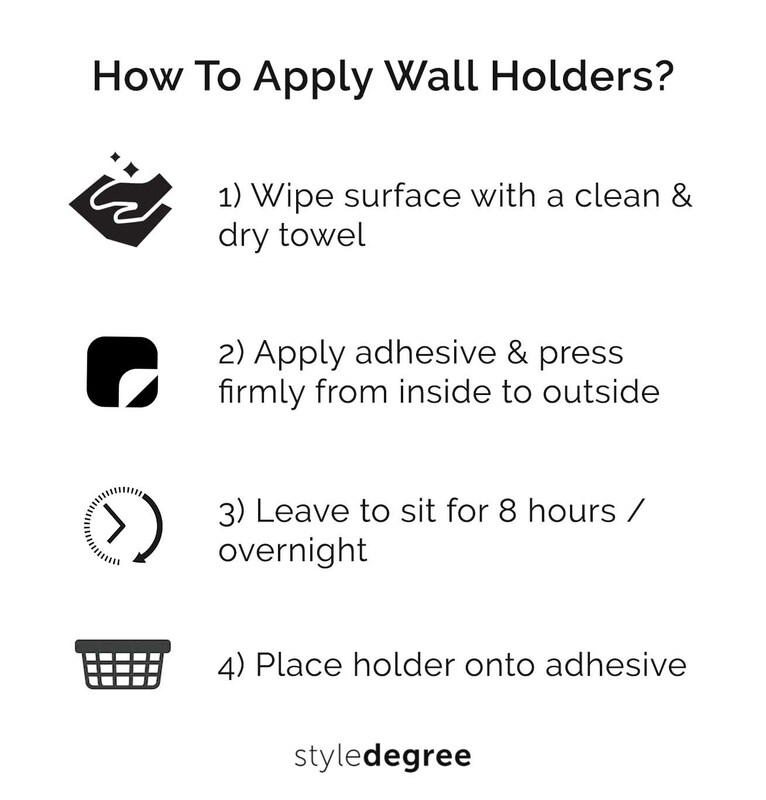 Perfect for tidying up your desk, organizing your kitchen or holding your toiletries, our Customizable Wall Organizer is the most well-designed and versatile essential for your home! Its customizable design allows you to personalise it to cater to your needs and preference! Simply mix-and-match the array of holders, magnets and hooks – there you go, it’s that easy! Keep your toothbrush and toothpaste organized with our Basic Toothpaste & Brush Holder! By keeping your brushing essentials elevated, it helps you save space while keeping your toothbrush hygienic. Featuring a toothpaste dispenser for added convenience, make your daily brushing routine a hassle-free activity with us! No drilling – simply stick & use! Perfect for smaller essentials such as socks, undergarment, lingerie and beauty accessories, it is easy to stay neat with our Socks & Undergarment Organizer Box (2pc Set)! It comes with a 2-piece set and features a unique attachable design for added stability! Get rid of messy cables lying in your home with our Pastel Power Plug Wall Holder (2pc set)! Easy to install, it is the perfect nifty holder to hold your 2 pin & 3 pin power plugs securely when they are not in use. Coming in 4 bright pastel colours, add liveliness to any area of your home. Save space and start organizing your cables with it! Closets need not be messy with our Rectangle Closet & Desk Organizer! With compartments designed to store your undergarments, ties and socks, you may wave good-bye to clothing mess with ease. Slim & compact, this holder fits into any drawer or closet easily! For the very first time, you are able to design your very own desk organizer to suit your needs and table requirements! You may stack them or place them side-by-side, it’s that simple! Besides, its unique design coupled with functional compartments makes it the best table organizer of its class. Create your very own organizer with us today! 4 different designs to suit your needs and preference! Large is currently out of stock & under backorder! Pre-order yours by making a purchase to be entitled to product reservation & priority shipping! Available by 1 May 2019, view our FAQ page for more details on backorders. Safety is always first! Organize your first aid supplies and medication with our 3-Tier First Aid Medicine Box. As its name suggests, its foldable layer design makes your essential easily reachable during an emergency and maximises storage at the same time! Just as its name suggests, The Elegance Jewellery Box (Mini) merges class, quality and function to create an organizer for your much-loved accessories. Crafted with the finest materials, it features rings holders and compartmentalised interior to keep your jewellery neat and protected. Besides, it has a built-in mirror for added convenience. Just perfect as a desk accessories organizer or as a travel essential! Our adorable Foodie Snacks Container allows you to organize your snacks and sweets beautifully! Perfect for home or pantry use, these food boxes help you to keep snacks organized and accessible. Besides, it features a lockable lid for hygiene purposes and removable cases for easy washing! "Fast delivery, good quality, nice designs. Will get again!" © 2019 Style Degree - Proudly Crafted In The Little Red Dot. Join Our Waiting List! Simply enter a valid email address below and be notified when fresh new arrivals are available! Congratulations! Use code "Welcome$8" to enjoy $8 off your first purchase above $99 - Remember to copy the code!